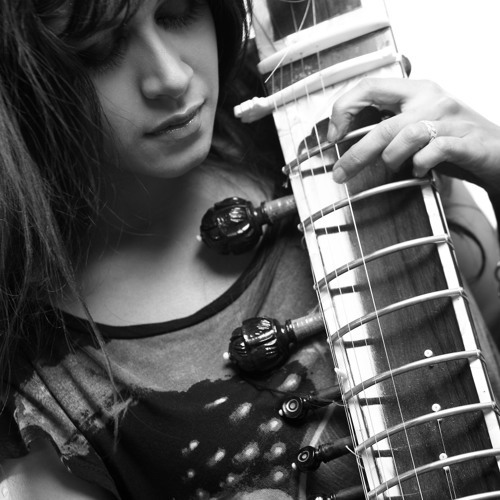 I am singer, Sitar player, composer, scientist and explorer Shama Rahman. I am the first Sitar player to perform on the ice in Antarctica where I was invited to be an explorer on an expedition with the first Antarctic Biennale. I am the first artist-in-residence with the pioneering wearable technology mi.mu gloves. I play with my 6-piece band and I have a forthcoming album entitled Truth BeTold. My poetic songs draw inspiration from my Bangladeshi roots, the childhood desert landscapes of the Middle East, and my later move to the UK, where everything I knew collided with London’s vibrant urban energy and musical characters. I take the sitar out of the traditional context, composing and performing across genres including, live electronica, hip-hop, drum ’n’ bass, jazz, worldbeats, Indian/western classical melodies, folk storytelling and beat poetry. Thank you to my supporters for a successful Kickstarter campaign, which was 150% funded here (10 April to 10 May 2016). I was an artist-in-residence with a very special new form of music technology called the mi.mu gloves – gloves which respond to the wearer’s movements. I use them to explore new electro-acoustic cross-genre Sitar-led songs & spoken word with jazz, electronica, hiphop, drum’n’bass & worldbeats, Indian/Western classically-inspired melodic arcs & folk-inspired storytelling. My residency culminated by scaling up the songs from the album into a multidisciplinary cross-arts performance via a collaboration with my live band of musicians, dancers and visual projection mapping artists. This was developed through public Lab sessions at the Southbank, with a final showcase in May 2016. This showcase involved a pioneering movement approach to an immersive theatrical Sitar cabaret/libretto performance of storytelling songs. The goal was to push the technology to discover its strengths and where it can add to modern possibilities of story-telling for musicians over the coming years. To write and ask me how I use the mi.mu gloves in my music, Click Here. Fantastic performace today at Alchemy Festival! Hope to see more forthcoming gigs of yours and hear more of your compositions! Thank you very much! lovely vocal chops! – great noise! !